I receive a lot of emails asking me this question. So I decided to do an FAQ to help you out. In my book I do recommend one for the UK which I used, however there is another way to find information with regards to Umrah visas. The best way to find reliable and approved Umrah visa agents is the respective Saudi embassy of your country. Saudi Arabia and every country have their own embassy website with information regarding that particular country. Under their Umrah visa section, they will have the names of the approved agents in this country that you can contact. This is the shortest and best way to find an agent that you know will be able to deliver and that has already been vetted by the Hajj and Umrah ministry. This applies to all countries. You will have to find the website for your respective country and research it. Saudi embassy websites are not the best-designed websites and expect they might crash, however it shouldn’t take you more than a few minutes. If you want to find the details for agents in the UK and US then you will have to Google them sadly. For some reason when the UK-Saudi embassy changed their page they removed their link. Usually the agents will try and convince you that they cannot issue only visas. This is not the case and you shouldn’t give up. You don’t have to take a package in order to perform Umrah. This is where agents make money and they will try and sell you their packages first. A client and a friend recently used one of the agents in the US and it turned out that they received their visas only a day before their flight! Apparently many agencies do this in the US and they work on the most urgent cases first. For me this is too risky and I would keep contact with the agency. In the UK I have used Prince Visa and they sent me my visa 2 weeks in advance which was brilliant as it was one less thing to worry about. If you are in the UK you can receive 15% discount off your next Umrah visa by quoting ‘MuslimTravelGirl’ when you book with Prince Visa. You don’t have to send your passport more than 3-4 weeks in advance, since your visa countdown starts from the day it is stamped and it’s valid for 30 days or 14 days during Ramadan. Visa prices are very volatile and it really depends on the time of the year. During Ramadan they cost £300, which is crazy in my opinion. However off peak they should cost £100-150/$200-$300 maximum. If they quote higher prices then check with other agencies. my understanding that umar visa is for free from the suadi embassy but maybe you are talking about agency fees right? Yes you are correct. The visa is free from the embassy but the agents are free to charge any price they want unfortunately. So can you apply for a visa with the Saudi Embassy directly or not? If so how do you go about it? Are you sure I cannot apply visa directly ? It says something about applying individually! What’s that about ? You will have to apply via an agent for your Umrah visa. You cannot go to the embassy alone and apply unfortunately. 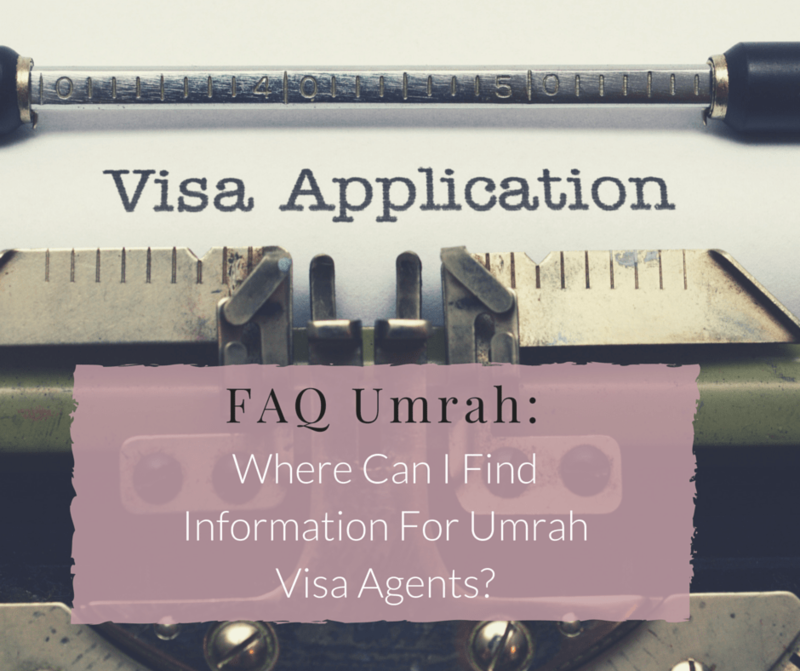 For Umrah visa you need to provide them with your passport so they can attach the visa to it. I am in the US and I am loving to perform Umrah in the last 10 days of Ramadan inshallah with my husband but we are looking for an agent who will help us get jut umrah visa ? Do you know someone by chance please ? Does the agency have to be approved by the ministry of Hajj, or is that just an option to go through an approved agency? It is better is they are long established and approved agency. Simply so you are more protected, we have seen many time people selling visas and scamming people. Thank you for your reply. Would you happen to know the answer to the following. I am really concerned about meeting visa requirements. The surname on my passport is different to all other documents. I got married and changed my surname hence all other documents are on my married surname. If I provide my marriage certificate as proof of name change would this be OK to get the visa? The name discrepancy is stressing me out and I’m due to submit all documents soon. I just came back from Umrah and just wanted to say I found your website VERY helpful! I particularity wanted to write to you about my experience with the company Prince Visa. The company is extremely professional and efficient. I was very worried about the length of time they would need my passport however they managed to get my visa within 1 day (although they say it can take up to 10 working days). The only thing I would mention is the discount they give is 10% not 15% when quoting MuslimTravelGirl however they are still well worth the money! Thank you so much for all your help! I am in USA on research scholar visa from Pakistan. I want to perform Umrah when i am going back to Pakistan. My brother is in Saudi Arabia i also want to visit him in that time period. so should i apply for Umrah visa or visit visa? Guide me in this regard. I want to perform umrah in 2017 from the uk. Is Feb/March the best time to go? when should I do my visa? and booking the umrah package? There are 4 of us going and it’s our first time. Please help. You should book your visa about 1 month before you travel. If you are booking an umrah package with an agency i recommend you find the best deal as soon as possible. They usually have early bird offers. If you are booking on your own a DIY Umrah option I would recommend you book your hotels and flights when you decide on your dates. Feb and March are good times to go since it is not too busy. Usually, busiest times are the holidays like Christmas, Easter and also school holidays. If you avoid those from the UK you should find some good deals. i am living in japan.i would like to perform umrah in the end of december.how could i apply for visa. You will have to find an agent in Japan to offer you a visa inshaAllah for Umrah. You cannot apply on your own. IF IF BOOKED HOTEL, CAN I GET UMRA VISA? You need an Umrah agent in Sweden to issue you with a visa. After that you can book your hotels and flights. You cannot ask for an Umrah from the embassy, they only deal with agents and not people. Can you recommend some agency in uk which will be able to help me with just the umrah visa? Salams yes, Prince Visa in London, if you search here you will see that they offer 20% discount for MTG readers just mention when you call them. I have booked an Umrah package in the last month of December from Germany. I am not sure how long the agent will keep my passport. Since I am a foreigner here in Germany and the agent also has my German Residence card, I have virtually nothing to stay in Germany. My agent told me he would give me passport back in December. Isn’t it too long for the Umrah agent to keep my documents? You should not give your passport or residence for so long. Usually, 3 -4 weeks before travel is enough in the UK. So not sure about Germany but to me it sounds a lot especially when you need the papers. Jazak’Allah for sharing your discount code for 20% off. However, having looked at the Saudi Embassy list of approved travel agents, Prince Travel is nowhere to be found? I appreciate they are efficient and seem to have good reviews, but surely an approved agent would be the better option? Or have I missed something…? They are approved and the authority that issues them is diff than the company name. They are very long established and provide services to other agents. You can ring and ask them. I am sporean living in jb with husband n son who is m’sian. I want to go saudi for umrah with my husband n son. Can i apply visa in malaysia. Iam singapore passport holder with more than five years holding long term visa in malaysia. Tks.